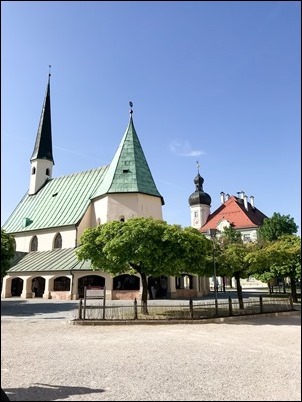 After finishing our meetings with the Holy Father last week, I came to Bavaria, to Altötting, which is the largest Marian shrine in Germany. I had not been here since I was a seminarian. 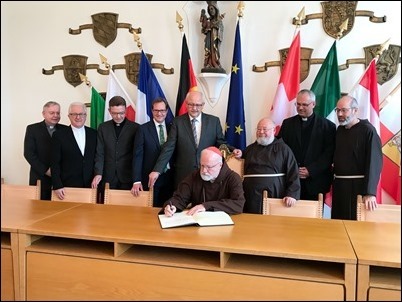 Our province of Capuchins in the United States was founded by the Bavarian Capuchins, and we’ve always had a close relationship with them. 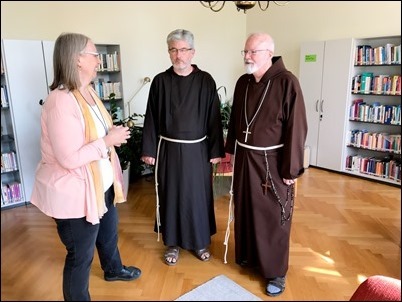 Hence, they invited me to come during this week when they were celebrating three important occasions: the 200th anniversary of the birth of St. Conrad of Parzham, the ordination of Brother Thomas Maria Schied, and the opening of the pilgrimage year in Bavaria. 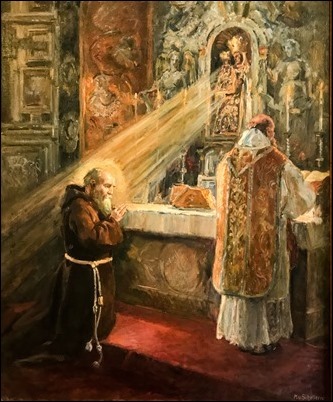 St. Conrad was a brother who was the porter of the Capuchin monastery and his job was to receive the people who came to the monastery, help people in need, and feed the poor. 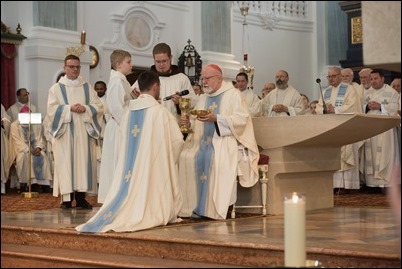 In many ways, his life very much parallels the life of Father Solanus Casey, another Capuchin porter, who was beatified in Detroit last year. Like Father Solanus, Brother Conrad was beloved by the people and there has always been a great devotion to him here. He was canonized in 1934 and I find it very interesting, that from the Reformation up until the time of Pope John Paul II, there were only two German saints canonized —St. 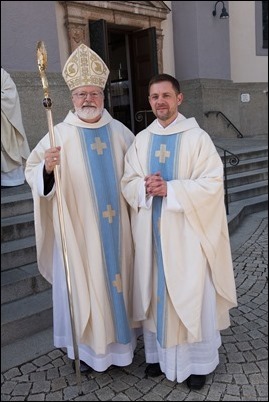 Fidelis of Sigmaringen, also a Capuchin, who was martyred by the Protestants in Switzerland, and Brother Conrad. Of course, Pope John Paul II later canonized other German saints but, for 500 years, these were the only saints canonized from Germany. 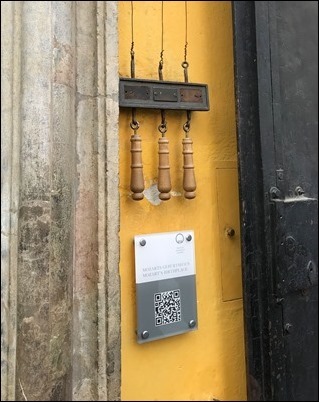 It makes me wonder if perhaps this was a way of expressing disapproval for the Protestant Reformation starting in Germany. 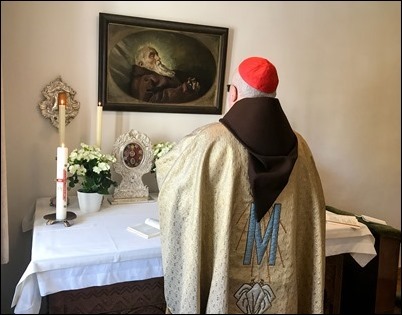 On Sunday, I had the opportunity to celebrate Mass in the room where St. Conrad died. In fact, one of the Capuchin provinces in the United States is the Province of St. Conrad. 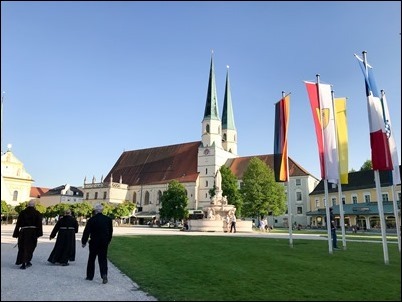 When the Bavarian Capuchins first came to America, it was during the Kulturkampf, which brought a great deal of persecution of the Church, and many religious orders came to the United States. 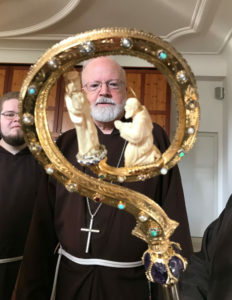 Among them were the Franciscans (the Holy Name Province, which is in Boston, has its origins in Germany), the Redemptorists, the Benedictines, and, of course, the Capuchins. At first, their work was among German immigrants. 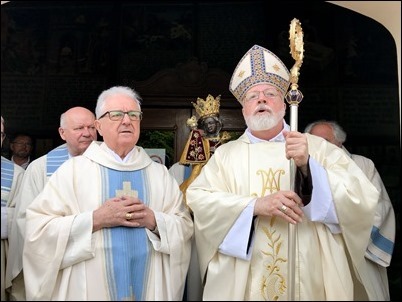 In Europe, the religious traditionally do not often staff parish churches, but in the United States because of the pastoral needs the religious were placed in charge of many parishes particularly for the different language groups. So, the initial ministries of our province were in the German-speaking parishes of Pennsylvania and Kansas. But, our province grew and was divided in two, and the new province was named for St. Conrad. We also started two missions: one in Papua New Guinea and the other in Puerto Rico. 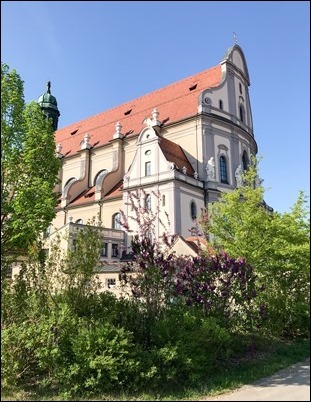 So, the work of these Bavarian Friars really multiplied because two provinces and two missions grew out of the original small mission. It is quite a legacy. 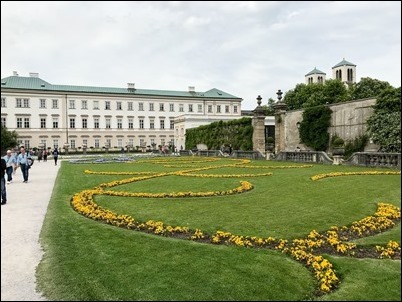 The shrine of Altötting is very beautiful and is centered around a main plaza. 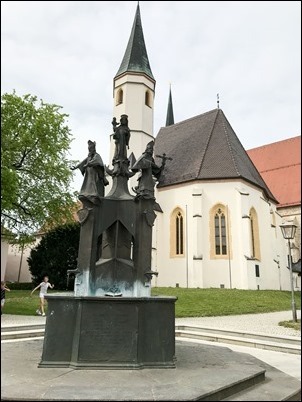 In the very center of the plaza is a church called the Chapel of Grace, which houses the statue of Our Lady of Altötting and is where Brother Conrad served Mass every morning. 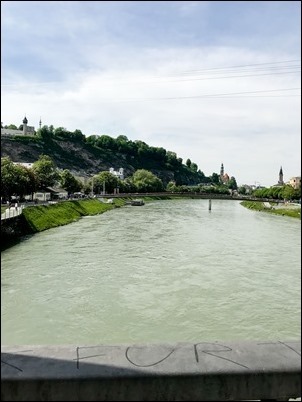 The devotion to Our Lady of Altötting began 500 years ago, when a child who had drowned was miraculously restored to life when placed at the foot of the statue of Our Lady. Since that time, it has become sort of a Lourdes of Germany, where people come to pray and seek healing. Surrounding the square are four other churches. 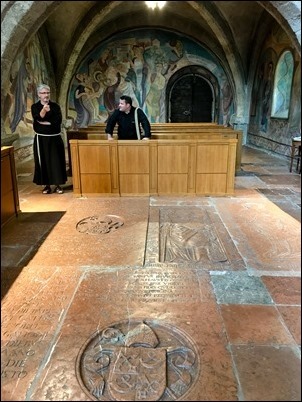 Two of them are Capuchin churches — one is the Church of St. Magdalene, which is a church where confessions are constantly heard, and the other is dedicated to St. Conrad. The other two churches on the plaza are the Basilica of St. Ann, which is one of the most beautiful churches I’ve ever seen in my life, and the other church is the parish church. I thought there were a lot of churches close to each other in Fall River, but here in this plaza there are five huge, beautiful churches! 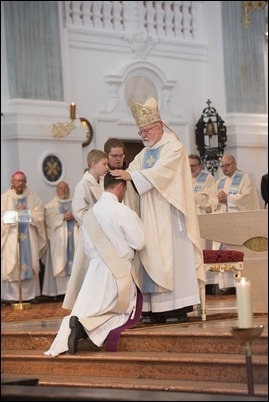 The events of the week began on Monday, with the ordination of Brother Thomas Maria at the Basilica of St. Ann. 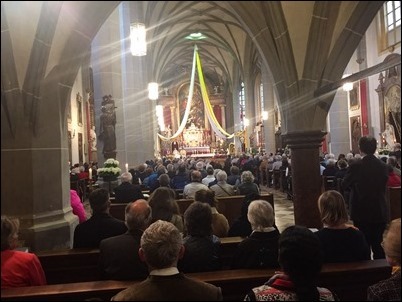 There were probably about a thousand people in the Basilica for the ordination, including a number of Capuchins from throughout Germany. 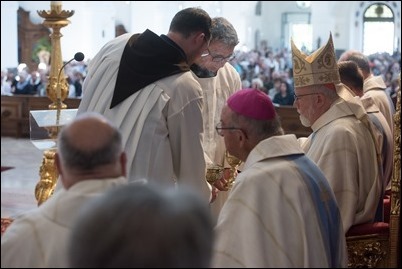 The following day was the opening of the pilgrimage season here in Bavaria. So, they invited me to celebrate a large Mass at the Basilica which was also broadcast on the radio. 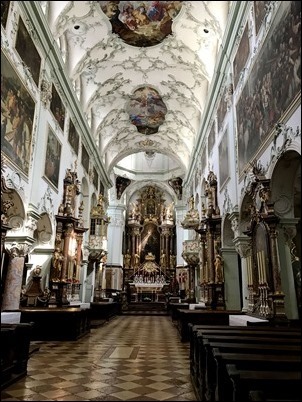 They had a full orchestra and choir singing a four-part Haydn Mass, which went for about two hours. In the basilica, they had the most beautiful crosier with an image of St. Conrad praying before the Blessed Mother. I thought I was going to have to restrain Father Jonathan from putting it in the luggage! 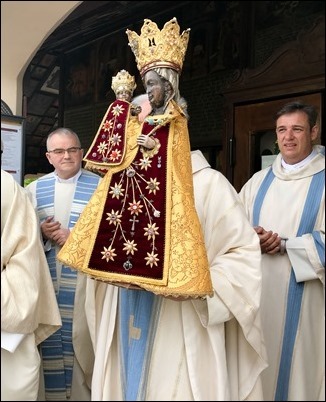 The Mass featured a procession from the Chapel of Grace to the Basilica with the statue of Our Lady of Altötting. 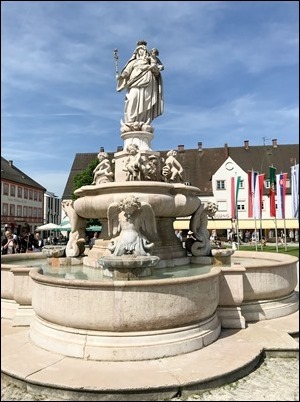 The robes of the statue are taken from the wedding dresses of the queens of Bavaria over the centuries. 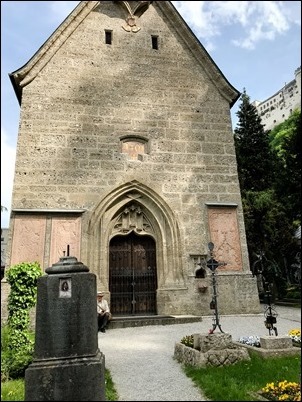 Also in the Chapel of Grace are buried the hearts of all the kings of Bavaria. At the Mass were many of the local dignitaries, including the mayor. So, following the Mass, we were invited to the town hall, which is just across the plaza. 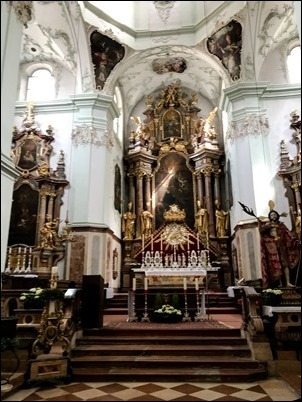 Of course, it was a little different from your typical American town hall, because it was filled with statues of the Blessed Mother, many saints, and statues of Pope John Paul II and Pope Benedict – the two popes who have visited the Shrine of Altötting. 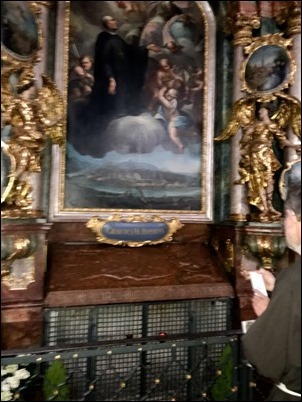 After showing me around a bit downstairs, I was taken to an upstairs reception room, where they had many pictures of Pope Benedict and a beautiful replica of the statue of Our Lady of Altötting. 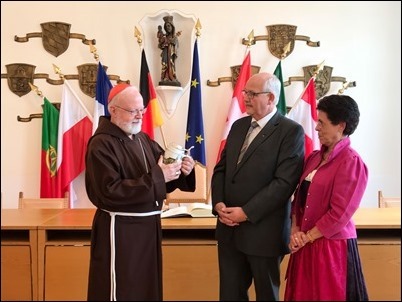 There was a short ceremony of welcome where the mayor and his wife presented me with some gifts, including a beautiful Bavarian beer stein with the coat of arms of Altötting. Then, they invited me to sign the guestbook which they call the Golden Book. The chair they asked me to sit in was the very chair Pope Benedict used when he signed the book during his visit. 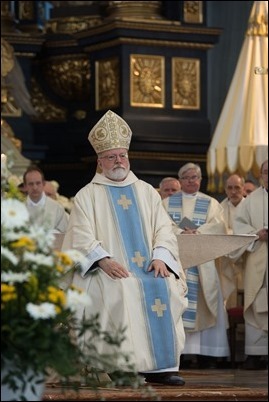 In fact, during his visit, they made Pope Benedict an honorary citizen of Altötting. Pope Benedict is from a small village very near to the shrine so, this was a very important place for him throughout his whole life and as a young man he came here often. 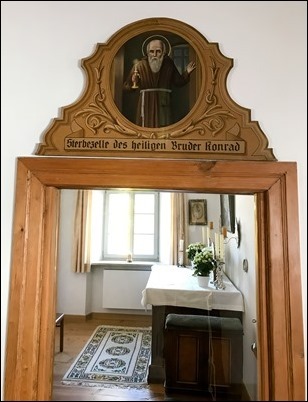 During my stay, the friars gave me the same room that Pope Benedict used when he visited Altötting. 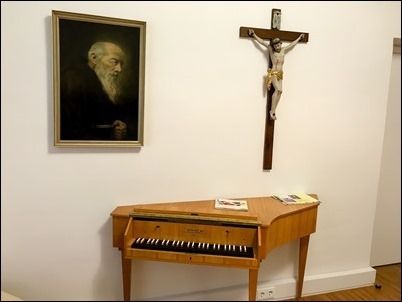 It is a very simple room, but as you can see they made a special concession for Pope Benedict — under the cross and the portrait of St. Conrad is a harpsichord! 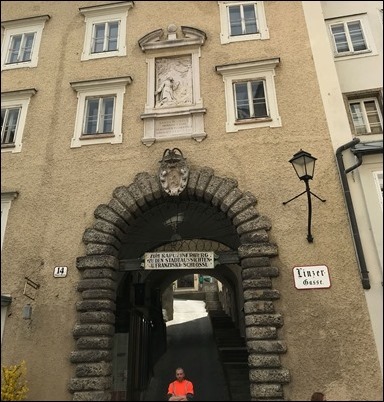 Altötting is just on the Austrian border so, on Wednesday, we had a chance to visit the Capuchin novitiate in the City of Salzburg, Austria, which is only about an hour away. 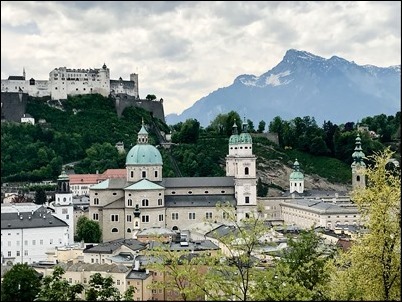 The City of Salzburg has a very interesting history. The founder of the city was St. Rupert, who became the first bishop and, for many centuries, the city was ruled by archbishops. The largest palace on the top of the mountain was a fortress built by one of those prince-archbishops. 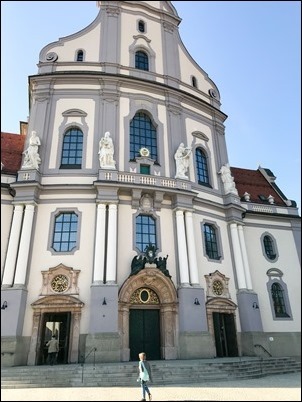 The novitiate was an old fortress on one of the highest points of the city that another of the prince-archbishops of Salzburg gave to the Capuchins. At one point the fortress was used to defend the city and it was also used as a place where they watched for fires because it was so high. You have to make your way up a mountain to get there and all along the way they had the Stations of the Cross going up the mountain. It’s a beautiful view looking out from the Capuchin novitiate. Behind the fortress, you can see the snow-covered Alps. 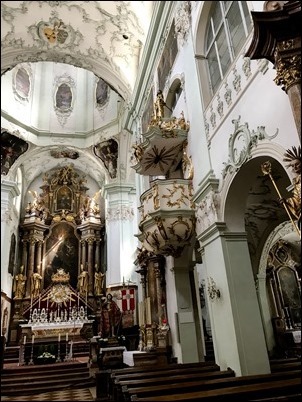 While we were in Salzburg, we visited a number of churches including the Benedictine church, which is one of the oldest in the city, where St. Rupert is buried. 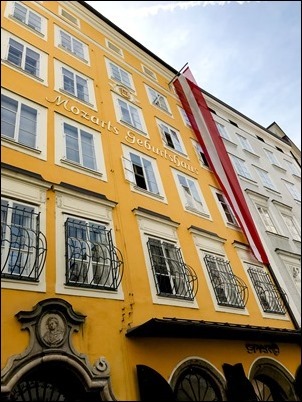 We also visited Mozart’s birthplace and the cemetery where his family is buried. 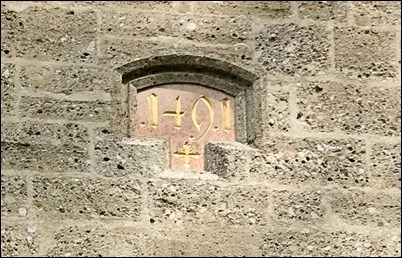 I took this picture of the stone chapel the cemetery of the Benedictine monastery because I was struck by the date over the door — 1491, a year before Columbus discovered America! 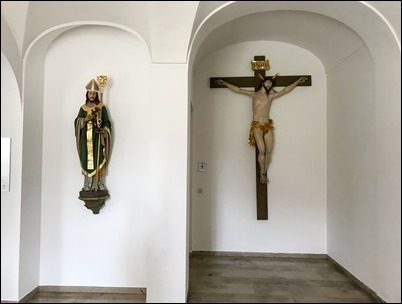 Thursday, back in Altötting, I visited some of the offices of the diocese. I met with Dr. Barbara Heller, the woman in charge of child protection. I was also very much impressed by the Catholic Charities office, which you might mistake for the a church. 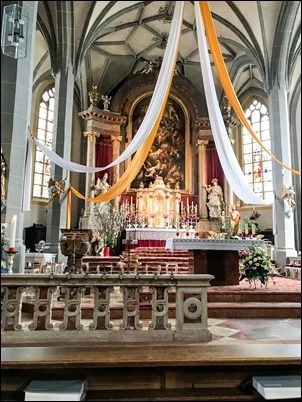 Returning to Bavaria for the first time since I was a seminarian has been a very moving experience for me — to be once again immersed in the deep Marian piety of the Bavarian Capuchins who had such an important role in my own formation and to be able to hear some of the German songs and prayers once again. It truly has been a renewing experience for me and I’m very grateful that I had this opportunity.